Tyler Ashcraft is a lot like other high school students who rush off to practice after the bell rings to release them from class. 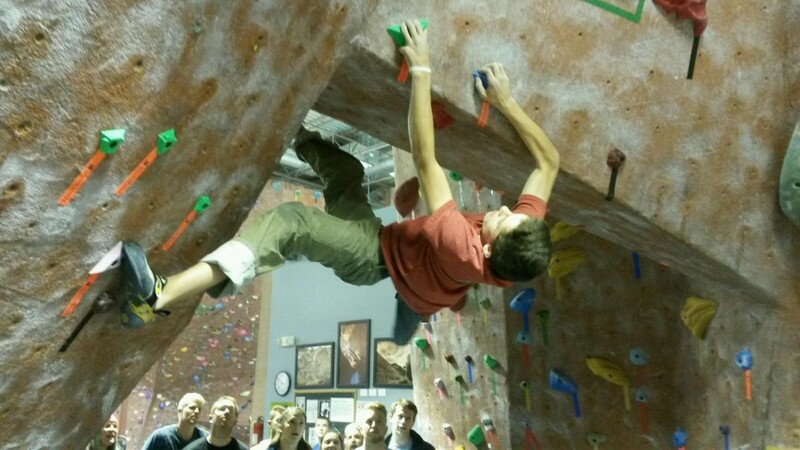 However, as 17-year-old Ashcraft grabs his backpack and leaves school, it’s not to the locker room or the football field: it’s Tuesday afternoon and he’s headed to rock climb at the Quarry, a popular indoor climbing gym in Provo. Ashcraft is on the Quarry’s youth team and climbs at least three times a week — after school on Tuesdays and Thursdays and in the morning on Saturdays. “I think that I’ve worked it out pretty well,” Ashcraft said. “I think it’s a lot like any other sport. A lot of the other sports actually do more hours so I think it works even better.” The team competes up to a national level. As teams and individuals compete nationally and rock climbing as a sport is looked at for the 2020 Olympics, it’s clear the rock climbing trend is here to stay. Chris McFarland is the regional manager of Momentum, the largest operator of climbing gyms in Utah. Momentum has expanded to three locations (Sandy, Millcreek and Lehi) under the direction of president and co-founder Jeff Pedersen. The Quarry, also owned by Pedersen, is a sister gym to Momentum. These indoor climbing gyms all consistently grow in membership as the popularity of indoor climbing continues to grow. McFarland noted that most universities and even high schools are now providing more climbing opportunities — a far stretch from the time of plywood panels. Willis Knapp, manager of the Quarry, echoes McFarland’s sentiment of the 1990s climbing culture. 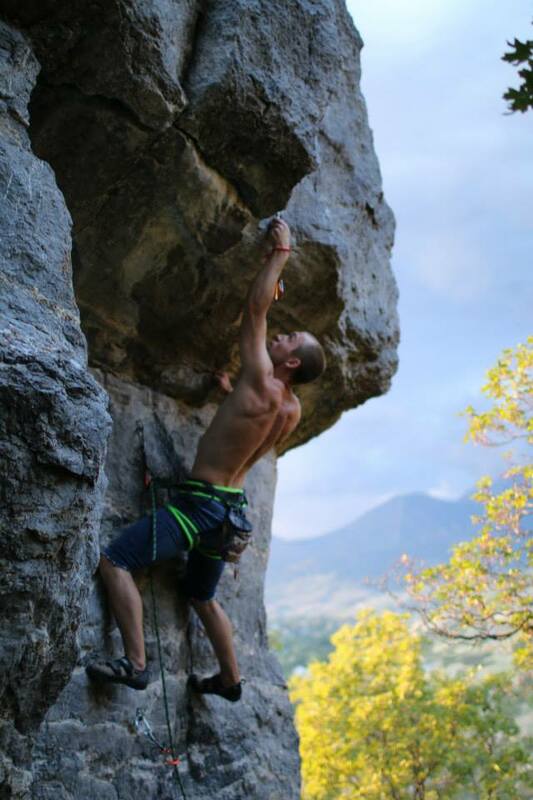 A BYU graduate in outdoor recreation, he has always been passionate for the outdoors and appreciative of the challenge of climbing. Knapp first started climbing in 1990 when a friend took him up Provo’s Rock Canyon. Knapp frequently tells the story of going up Rock Canyon, building a bonfire by the painted green gate and not seeing anybody. Now, it’s rare for him to not see other climbers while up the canyon. Knapp attributes much of the growth of outdoor climbing, like the popularity of Rock Canyon, to the increase in indoor climbing. The Quarry has sat comfortably at 2494 N. University Parkway since 2000, and Knapp has been the manager since 2006. A relatively small facility at only 13,000 square feet, the Quarry boasts an impressive membership of almost 2,000. Management runs smoothly with 25 employees. The monthly memberships range from student or family memberships to the youth team like Ashcraft’s. The youth programs are popular in the area. Ashcraft, the 17-year-old junior at Springville High School, has been climbing for more than three years and has been a member of the Quarry’s youth team for three years. He has mastered a 5.13 rating while lead climbing, which is climbing with a rope and clipping in along the way, and a V9 rating while bouldering, which is climbing shorter heights without ropes. For comparison, a 5.15 grade is the highest rating that exists — reserved for climbers who are aspiring Spidermen. 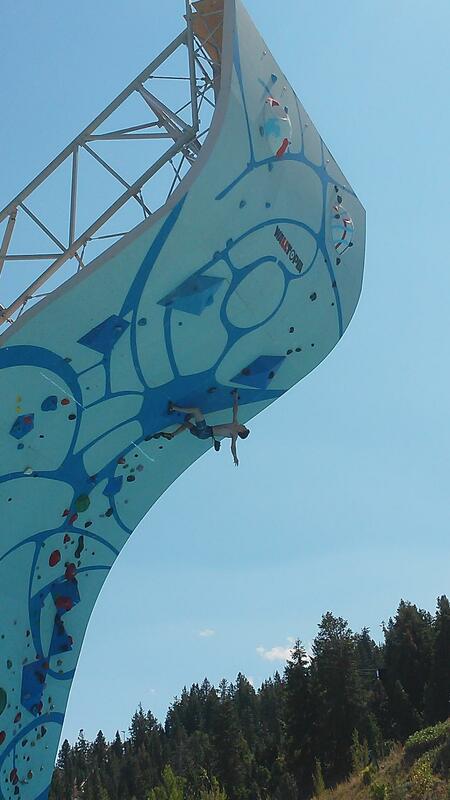 Ashcraft has climbed outdoors, but was first introduced to the sport through indoor climbing. The training can be demanding, but Ashcraft wouldn’t have it any other way. Ashcraft’s two younger brothers also climb at the Quarry. 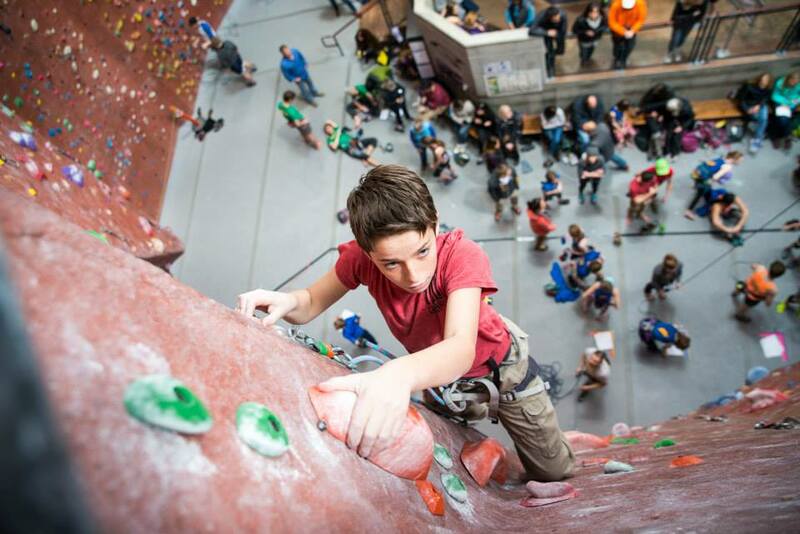 His brother Devin has been climbing for a few years, and his youngest brother has just recently adopted the sport. Matt Rossi has been an employee at the Quarry since August 2015, but has identified as a climber since he was 15. Rossi is a junior at UVU studying business management. Originally from southern California, Rossi moved to Utah when he was twelve. A friend of his introduced him to the sport and he was “hooked right off the bat.” That friend has gone on to be a professional sport climber. Though he prefers to climb outdoors, Rossi has embraced the indoor-climbing lifestyle, especially during Utah’s cold winter months. Not coincidentally, winter is when the Quarry sees a peak in its membership. Rossi, with hands visibly cut from rock climbing, palms a stress ball; he is a passionate climber who plans to get in two-hour sessions with a climbing buddy early on Tuesday and Thursday mornings this semester before classes. He often has friends or ward members ask to go climbing with him. Not once has he had someone not enjoy climbing. Because Rossi broke his arm while surfing, he wasn’t able to “send” (climber lingo for cleanly completing a route) as many climbs as he wanted to this past summer. Knapp, manager of the Quarry, sees a great future for rock climbing and not just in the state. He excitedly alluded to the potential of an added Olympic sport. He believes the popularity stems from different sources: the lack of people required to participate, improved equipment and the achieved physical and mental stimulation. 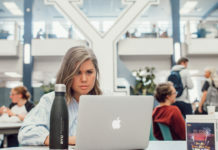 Kjersten Johnson is a BYU journalism major and life desk editor. Kjersten's dream career is to write for National Geographic.